and everyone’s hand against him, and he will live in hostility toward all his brothers.” 13 She gave this name to the Lord who spoke to her: “You are the God who sees me,” [“El Roi” or “The Seeing God” – “The God Who Sees/Is Seen”] for she said, “I have now seen the One who sees me.” 14 That is why the well was called Beer Lahai Roi; it is still there, between Kadesh and Bered. Today we’ll reflect on Jesus’ elevation of women in antiquity. But the best place to start, is to go waaay back. Long before the birth of Jesus, during a time when women were nameless, slaves were objects, and foreigners were irrelevant, God encountered an Egyptian slave girl – Hagar. And this story shows us just how much God values women. A woman whom society would have said didn’t matter, whom even God’s own people abused and objectified, was honored by God in amazing ways: Hagar is named, pursued and blessed by God; she sees God, names God, and her son is named by God; she’s given agency and God preserves her story. Although those around her only refer to Hagar by the title “slave,” God calls her by name. When Hagar runs from her horrifically violent and inexcusably cruel forced surrogacy, God searches for her like a precious treasure. God finds her and asks, “Where are you coming from?” making room for her story and showing care for her suffering. Then God gives her a blessing that parallels the blessing of Abraham. This story is the first instance in Scripture where we see this phrase “The Angel of the Lord.” It can refer to a messenger (like the Angel Gabriel) or the divine (God’s very self, often understood as pre-incarnate Christ). In this text, it’s the latter. God didn’t send an angel with a message; God appeared to Hagar. In what form, we do not know. But somehow she beheld God. And there are not a lot of instances in Scripture where God is named by someone other than God Himself. But this is one of them. Hagar could name God because she had truly seen God. In a time where so many went unnamed and so few women were mentioned, Hagar’s story was preserved so that we can see the heart of God who sees and loves and honors women. May we go and do likewise. 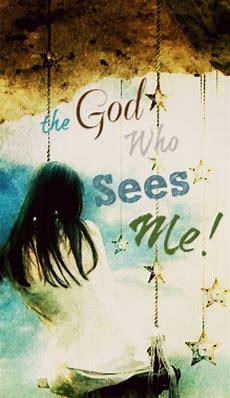 Prayer: God, You are the God Who Sees. Thank You for who You are. Help me to see the women around me as You see them. Help me to see me as You see me. Give me the courage and freedom and fortitude of heart and mind to love and honor the women you’ve placed in my life, through the power of Your Spirit within me. In Jesus’ name. Amen. Read Romans 8:1-13 (NET Bible): Now when Jesus returned, a crowd welcomed him, for they were all expecting him. 41 Then a man named Jairus, a synagogue leader, came and fell at Jesus’ feet, pleading with him to come to his house 42 because his only daughter, a girl of about twelve, was dying. As Jesus was on his way, the crowds almost crushed him. 43 And a woman was there who had been subject to bleeding for twelve years, but no one could heal her. 44 She came up behind him and touched the edge of his cloak, and immediately her bleeding stopped. What’s going on in this passage? Describe the bleeding woman’s situation. How has she suffered? Why do you think Jesus stops after she is healed instead of just moving on? Why might it be significant that this woman told her story before the crowd? How might this have been important, specifically to Jairus? How do we see Jesus elevating women in this story? In narratives like this, I like to imagine myself as different characters to help me understand and picture the story. If it’s helpful for you, try reading the passage again and imagine yourself as each character mentioned in this story. A twelve-year-old girl is sick and dying. Her father is desperate and Jesus is going to help. An unnamed woman has suffered immensely for 12 years. The woman is in pain—with a perpetual menstrual bleeding. She is poor and unclean—she spent all her money on doctors and her bleeding would have prohibited her from entering spaces of worship or fully participating in society. She is desperate and full of courage and exercises great faith—she pushes through the crowd (who could have been enraged by her touching them) and touches Jesus. Jesus heals her. I used to always hate this part of the story because it seemed mean. She just wanted to slip in and get her healing, but Jesus calls her out. I used to wonder if the woman was embarrassed. But after reading this passage countless times and walking with God a bit longer, and with the help of a dear friend who helped me to see this passage in a new way, I now love this part the most. I think Jesus stops to make room for this woman to testify. She is given an ear of the crowd in a world that didn’t even bother to know her name. Jesus has the eyes and the ears of the crowd and even an important official (Jairus), because they think he’s important. He turns their gaze to this woman, because He thinks she is important. And they all listen as she tells her story. There is power in testimony! The power of God is put on display in our stories, especially the stories of those we tend to ignore, overlook, or refuse to touch. And as for Jairus, this testimony may be just what he needed to hold on a little longer when he received the news that his daughter died, and Jesus asks him to have faith. Jesus gives His full attention to two women in this story—a sick woman and a dying girl. In both cases, although in unique ways, He loves and cares for them. It’s more than just the healing; it’s the way they are healed. Jesus stops in His tracks to make room for the story of the bleeding woman. And He changes the course of His whole day (with the whole crowd behind Him) to go to the home of a little girl, take her by the hand, and heal her (resurrect her!). Jesus, in the fullness of God Who Sees, saw them both and loved them. How have you been taught to view women (from your family of origin, culture, society, teachings in your church, examples or systems around you, etc.)? How do you treat or consider the women around you? Really think about and try to articulate your responses. How do you think your view lines up with how Jesus in the New Testament and God in the Old Testament saw and treated women? In light of today’s study, are there any ways God might be challenging you to honor the women in your life? If you’re a woman reading this, are there any ways God may be challenging you to honor yourself? In light of the world we live in today, what would it mean for you to truly see the women in your life, and to treat them as Jesus would? (One good place to start might be to ask them.) Spend time reflecting on these things with the Lord. Hagar said, “I have now seen the one who sees me.” You wrote, instead of remembering only the abuse she suffered, she could now remember God.” And your gentle challenge to see myself as He sees me- all chime together in harmony to bring voice to my past pains and the God who was there and is here with me- seeing and loving, healing and redeeming what no one else could see or fathom. Thank you for your posts- both this week’s and in times past. They are deep, compassionate and wise. It’s wonderful to love and serve the God who sees me! We often go through those dark valleys where we can’t even see ourselves or where we are… yet He sees us. He also challenges us to see those who are faceless nameless voiceless in need of His love. Thank you for your comment. A joyous Christmas to you.